Hampton University Direct Broadcast Antenna installed on top of the Harbour Centre. HAMPTON, Va. (September 10, 2018) – As the east coast watches and prepares for Hurricane Florence, Hampton University is equipped with storm watching technology that rivals most weather centers in the country. Hampton University’s NASA-funded five million dollar Direct Broadcast Antenna can generate early warning signs of severe weather, like Hurricane Florence, within a 2,000 mile radius of our local communities. 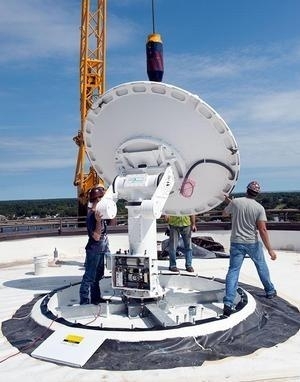 This antenna, which sits atop the Hampton Harbour Center, is a state-of-the-art satellite receiving system and provides satellite images and data within minutes after the satellite flies overhead. Images from the links, which are provided below, include both visible and infrared views providing information on temperature, humidity, storms and precipitation. These images show better detail than can be seen in typical satellite images. For more information about the links, please contact Dr. William Moore at William.Moore@hamptonu.edu or 757-727-6240. *A note on using the satellite images, the date and time associated with the image is when it was processed, usually within about 10 minutes of the satellite overpass. The time is reported in Universal Time (UTC) which is 4 hours ahead of Eastern Daylight Time and 5 hours ahead of Eastern Standard Time.